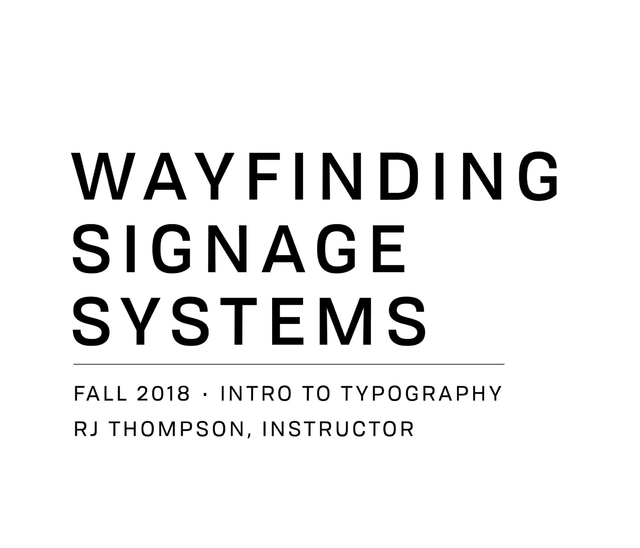 "YSU Wayfinding Signage Systems: Northeast Ohio Region" is a book of conceptual wayfinding signage mock-ups produced by Graphic + Interactive Design students in RJ Thompson's Intro to Typography course at Youngstown State University. RJ Thompson is a tenured Assistant Professor of Graphic + Interactive Design in the Department of Art at Youngstown State University. Parallel to his teaching, he is the Principal and Creative Strategist for +Public, a Pennsylvania-based social enterprise that focuses on cultivating community and economic development impact through the creation of branded communication platforms, creative place-making, and storytelling initiatives for communities-in revival. In 2015, he was one of several recipients of the National Endowment for the Arts “Our Town” grant, valued at $100,000, for the INPLACE (“Innovative Plan for Leveraging Arts & Community Engagement”) project. In 2017, RJ received a “Best of Marketing Award” from the Ohio Economic Development Association for his efforts in rebranding the City of Youngstown, Ohio.